Most tailors have a house style that defines both the silhouette of their suits and how they execute the small details. Tailors have a house style for numerous reasons. Sometimes a house style is a matter of pride that the tailor wants to stick with his or her vision. Sometimes a house style is all a tailor is able to cut or is what the tailor feels most comfortable doing. Sometimes a house style makes a tailor’s job easier because it removes confusion by making all suits in the same manner. But any tailor is able to make small adjustments to a house style, and a house style may include a range of variations. Some tailors will make small changes to create different effects, such as to make a jacket look more formal or more relaxed. While many tailors just use small details, like the type of edge finishing or pocket, to create a garment that looks more or less formal, some tailors may slightly alter the cut for this effect. Some people may choose an English tailor with a stiff look to make their suits and dinner jacket and an Italian tailor with a soft, relaxed look to make their sports coats. 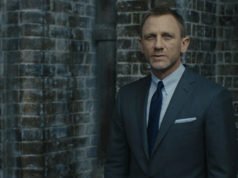 We can see this with the brands of Daniel Craig’s tailored clothes in Spectre; the suits and dinner jacket are made in a structured Savile Row style by Tom Ford and the odd jacket are made in a lightweight and unstructured style from Brunello Cucinelli. In some James Bond films we can even see a bit of this variation within the same tailor. 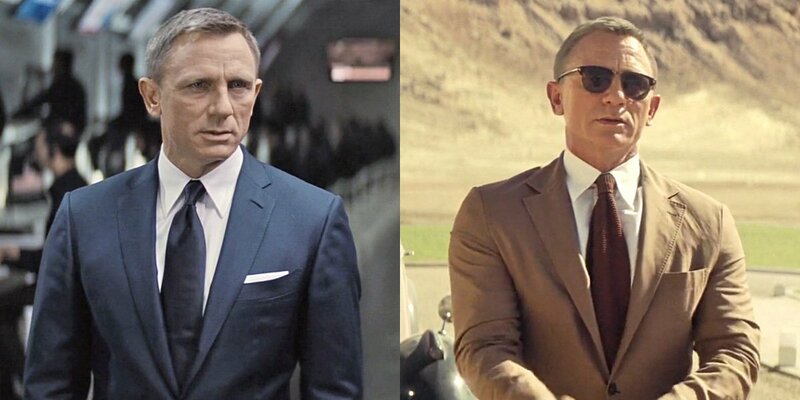 Daniel Craig’s tailored clothes in Spectre from two different brands: the structured Tom Ford suit on the left and the unstructured Brunello Cucinelli jacket on the right. 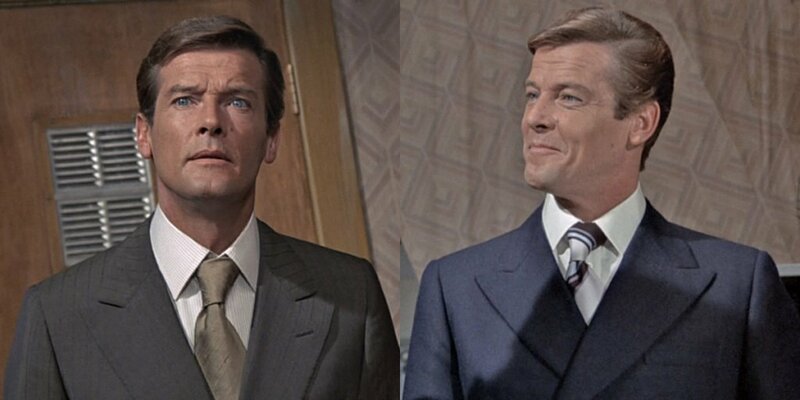 Two of Roger Moore’s tailors, Cyril Castle and Douglas Hayward, occasionally made small adjustments to the silhouettes of theirs suits and jackets. The following examples show very subtle changes in both tailors cuts. Mayfair tailor Cyril Castle would cut drape into some of Roger Moore’s more relaxed suits and jackets that he made for The Saint in the 1960s, while the most formal of the suits and jackets were usually cut with a clean chest. Castle tailored all of Roger Moore’s jackets for his Bond films with a clean—but full—chest due to 1970s trends for a closer cut, though there was some variation in the shoulders. Castle’s jackets in The Man with the Golden Gun have slightly narrower shoulders than the jackets he made a year and a half earlier in Live and Let Die . The narrow shoulders were trendy at the time. 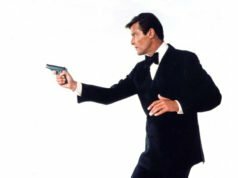 The wider lapels in The Man with the Golden Gun accentuate the narrower shoulders. 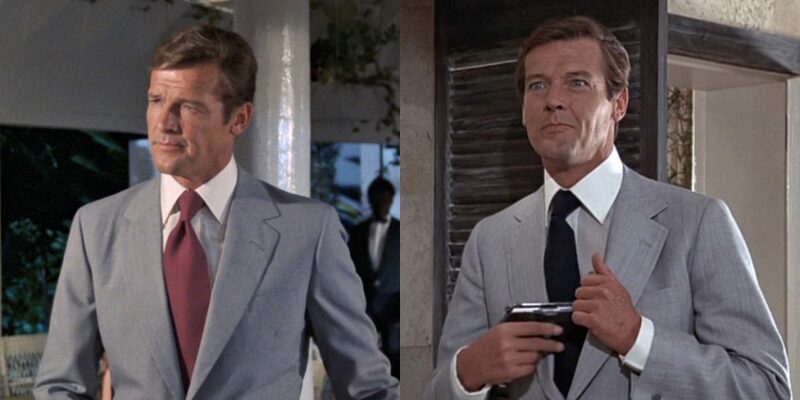 Cyril Castle tailored wider shoulders with natural sleeve heads for Roger Moore in Live and Let Die (left) and narrower shoulders with gently roped sleeve heads (but wider lapels) for Roger Moore in The Man with the Golden Gun (right). Castle also varied the amount of roping on the jackets in both films. 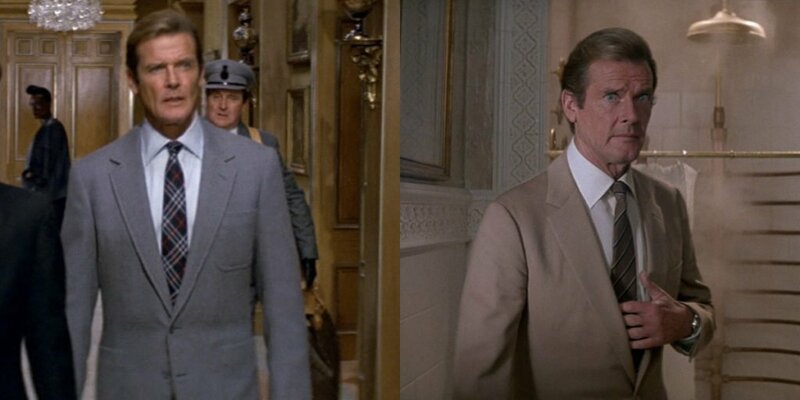 The suits in Live and Let Die have no roping, but the tan sports coat does, which makes the shoulders look wider and is reminiscent of what Castle tailored for Moore in The Saint. The sleeve heads in The Man with the Golden Gun are all slightly roped or more, which helps to offset the narrow shoulders. The off-white silk dinner jacket in The Man with the Golden Gun has a bit more roping to give it a more formal look. The double-breasted blazer in that film has more roping to give it a regal military look. Cyril Castle used various degrees of roping in Roger Moore’s sleeve heads. On the left is an olive suit with very subtle roping in the sleeve head, while on the right is a navy blazer with more pronounced sleeve heads. For A View to a Kill, Mayfair tailor Douglas Hayward unusually tailored the grey tweed jacket that introduces James Bond’s alias James St. John Smythe with a little drape in the chest. Drape is the folds at the side of the chest. Hayward typically cut a clean chest, one without the folds of cloth. The drape in this case is to make the jacket look more relaxed and to look more like one worn worn by the English royals. Prince Charles, like his great uncle The Duke of Windsor before him, is a fan of the drape cut. The tweed jacket on the left has a bit of drape in the chest, compared to the leaner chest that Hayward usually cut of the gabardine suit jacket on the right. Both are from A View to a Kill. The examples given here are things that a tailor may choose to do. Many tailors do not believe in changing the shoulder line or the amount of drape for different types of jackets, but some may be willing to cut their sports coats a little fuller for the ability to layer a jumper under the coat. Some tailors may only use more shoulder padding to enhance certain body types, and some may use the same amount of shoulder padding—or lack of shoulder padding—no matter the body type because they believe their standard silhouette works for everyone. Great post! The subtleties in the drape and the roping can transform an outfit greatly. It’s definitely in the details here! Roger in his blue blazer looks like he’s enjoying a joke against Roger in his olive suit. I can’t help but wonder what might have been said. On a more relevant and serious note, this is a great article and really makes me appreciate drape more as part of the silhouette, not just shoulders and waist suppression. Sinclair did decrease drape in the mid ‘60s. What is a good resource to learn more about silhouette? Matt here a VERY INTERESTING THING. Is a Italian TV show of 1974,with Roger Moore as guest. Moore wear a Cyril Castle suit. I’m very surprised: Roger Moore was speaking a excellent Italian !